Please weigh ingredients for best results, measure carefully. – Sprigs of fresh thyme (minced): 4 Nos. – Preheat oven to 220C/425F. – Mise en place, this is very important. – Line your baking tray(s) with baking parchment. Alternatively, use a silicone mat. – On medium heat, heat the butter, salt, pepper and water in a heavy saucepan. Let the butter melt. – When the water comes to a boil, tip in all the flour and onion powder at once. You do not want the water to keep boiling or the liquid will be lost by evaporation. – Stir vigorously with a wooden spoon until the mixture pulls away from the sides of the saucepan and forms a smooth ball. – Let it cool for a couple of minutes. Do not add the eggs when the dough is hot or the eggs may ‘cook’. – Add a tablespoon or two of the extra beaten egg if needed. At the right consistency, the dough is supposed to stay on the spatula and then fall in a thick ribbon. I used almost 120 grams of egg. – Remove the bowl and stir in the cheese and thyme. – Scrape the mixture into the pastry bag. Pipe into small mounds (about a large cherry tomato) spaced about an inch apart. Alternatively, use 2 spoons to drop the mixture. 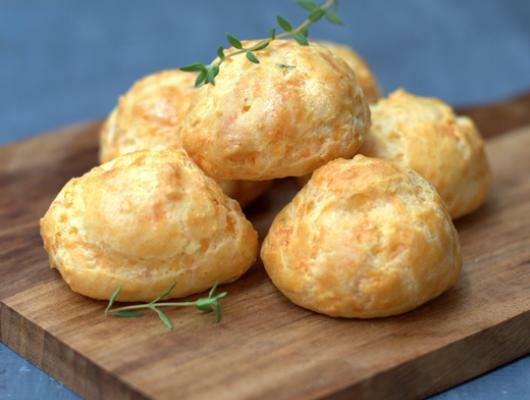 – Top each puff with a little of the remaining cheese. – Bake at 220C for 5 minutes. – Lower the temperature to 190C and bake for another 20-25 minutes or until golden brown all over. – These taste best served warm. If necessary, the baked puffs can be re-warmed in a low oven for 5-10 minutes. Serve immediately. 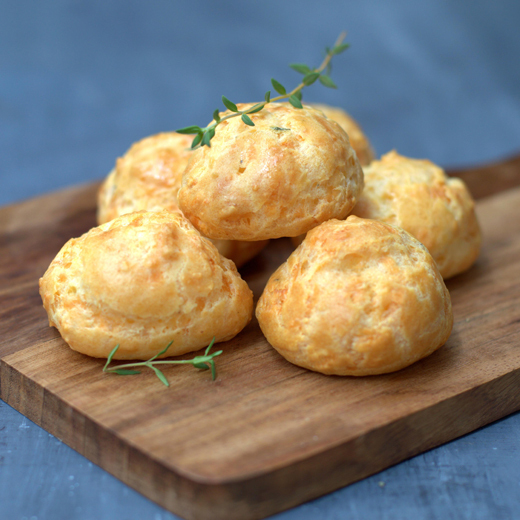 Gougères or less fancily put, French Cheese Puffs are delicious little bites you could serve warm on their own or with wine. You could also split them and sandwich with your favorite filling. Either way, if cheesy, eggy is your kind of thing, you will love these! All the more, if you make these in the KitchenAid Stand Mixer as it takes care of the hard work for you!